This past weekend, a daughter of a friend of mine sat for the so-called Center Test for university admissions. I know the girl well and on the day before the exam, I had lined her a message saying: Best of luck. I’ll keep my fingers crossed! 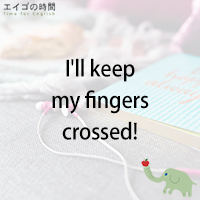 Now, are you familiar with the expression “to keep one’s fingers crossed”? You “cross your fingers” or “keep your fingers crossed” to hope that things will happen in the way that you want them to. For example, we’re having a barbeque party tomorrow. So let’s keep our fingers crossed that it doesn’t rain. You also keep your fingers crossed for someone to wish them good luck or success. For example, your friend is taking the bar exam. You’re keeping your fingers crossed for him. Likewise, you can ask someone to keep their fingers crossed for you. For instance, my job interview is tomorrow. Keep your fingers crossed! 誰かの幸運や成功を祈って指を交差させることもあります。例えば、お友だちが司法試験を受けるとします。あなたは彼の幸運と合格を祈ります。You’re keeping your fingers crossed for himですね。同様に、誰かに自分の成功を祈っていてねとお願いする場合もあります。例えば。明日、就活の面接があるの。うまくいくよう祈っていてね。Keep your fingers crossed!